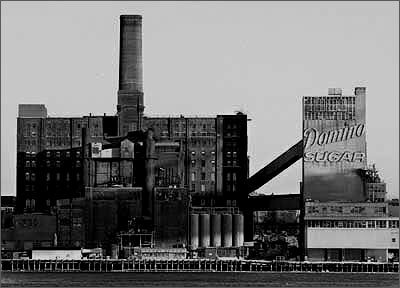 "It was a sweet victory for preservationists, as the Domino Sugar Refinery Building received landmark status Tuesday – saving it from the wrecking ball. The Landmarks Preservation Commission voted unanimously to bestow landmark status on the three connected buildings, which in their prime produced three-million pounds of sugar a day. The new status will most likely send the site's owner, Community Preservation Corporation Resources, back to the drawing board on their plans to develop the area. The famous Domino sign would also be integrated into the development. The firm has said it does not see the need to save other buildings on the site." This page contains a single entry from the blog posted on September 26, 2007 4:36 AM. The previous post in this blog was Contemplation by Theresa J. The next post in this blog is Eleven 2 Eleven Boutique: Being Forced Out.